at 210-386-9032 or via email at cyoblessedsacrament@yahoo.com. 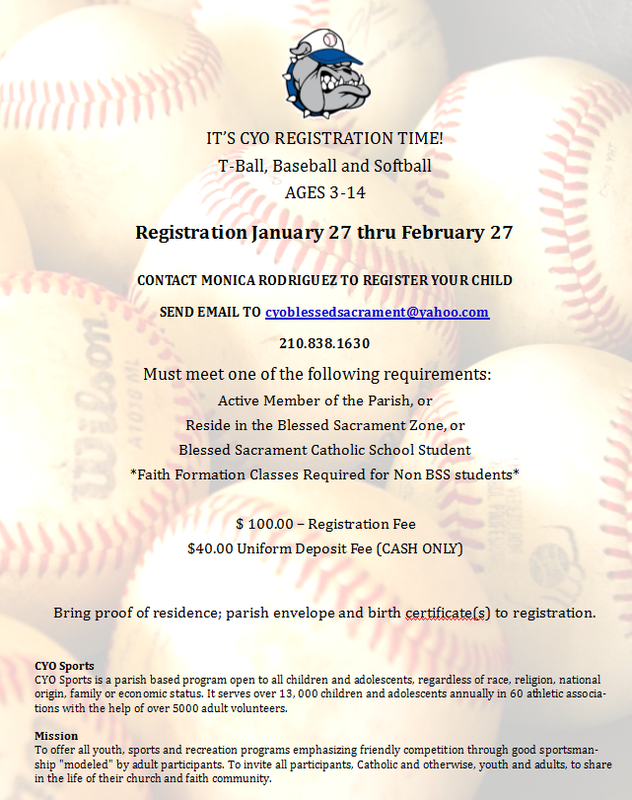 CYO Sports - is a parish based program open to all children and adolescents, regardless of race, religion, national origin, family or economic status. It serves over 13,000 children and adolescents annually in 60 athletic associations with the help of over 5,000 adult volunteers. Mission - To offer all youth, sports and recreation programs emphasizing friendly competition through good sportsmanship "modeled" by adult participants. To invite all participants, Catholic and otherwise, youth and adults, to share in the life of their church and faith community.